Mold Chutes are an ideal solution to prevent your parts from scattering randomly in the "drop zone." Mold Chutes ensure your parts land on the conveyor or in the packing case -- not on the floor. 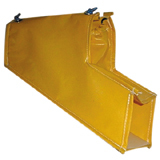 Mold Chutes are made of durable plastic with a PVC lining in the bottom to protect even delicate molded parts. They are uniquely constructed so they will not absorb oil or grease, while being abrasion, puncture and tear resistant. They are easy to clean and have no folds to trap moldings or dirt. Mold Chutes are available in a wide variety of styles and sizes, and can easily be attached to your machine using magnets. The unique design of right angle mold chutes allow for it to attach to each mold half. As the mold opens and closes, the mouth of the chute opens and closes to provide better protection from contaminants. In-line mold chutes attach to the press frame and are static.